1. Hand Drawn means it was Created, which means God is the Creator. The expensive Art Paper means, the things of God are valuable. 2. The Wooden Rack means, the Wooden Cross of Jesus. 3. The Three Points of the Wooden Rack means, The Father Jehovah, Jesus Christ, and the Holy Spirit. 4. The Wooden Rack also means, Protection for the Pool Balls. 5. The Balls are the Body of Christ, which are protected by God. Those who are not inside the Pool Rack will be hit from all sides by Satan. 6. The game is the Spiritual War between God and Satan. 7. The over all image of the Wooden Rack equals the “I AM”. 2114. Vision given to Raymond Aguilera on 31 August 2012 at 3:51 AM. 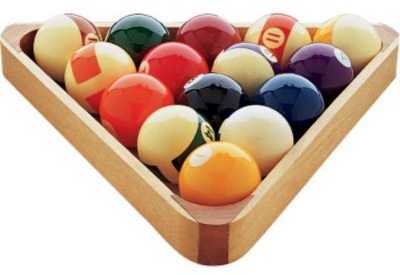 During prayer the Lord gave me a vision of a wooden rack with some pool balls inside of it. I found this vision unusual, because it was a pencil drawing made on expensive drawing paper. I am adding this picture to show people what I’m talking about, but the angle of the artwork was different. So, what I saw, was a pencil drawing of a wooden rack holding pool balls, made on some fine art paper, but the picture was in a slightly different angle than what you see below.